Melloy Dodge is proud to be the top Dodge and RAM dealer in New Mexico. We care about all aspects of the customer service experience, and we want to provide shoppers with the best and most up-to-date information about vehicle options. 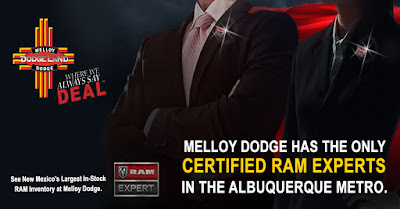 Melloy Dodge has the only true Certified RAM Experts in the Albuquerque Metro area, with the largest in-stock RAM inventory, so if you’re looking for expert help with selecting a new truck, you’ve come to the right place. RAM trucks deliver the highest quality on the road. In fact, more than 80% of RAM trucks in each model year from 2003 to 2016 are still on the road today! RAM trucks are tough and durable, ready to take on any towing or hauling assignment that comes their way. Despite the performance focus design, RAM trucks offer a luxurious, comfortable ride. In a RAM truck, you can confidently go where other cars can’t. If you want to learn more about the advantages of driving a RAM truck, or see our selection RAM 1500, 2500, and 3500’s, visit Melloy Dodge and ask to speak to one of our Certified RAM Experts.